We’re always hunting for innovative way to present different cuts on the plate. Our master butchers have created new and tasty ways of preparing and presenting on of the best slow-cooked meats you can use out of a carcass. Sam Kane, Head Chef at Bert’s, Merivale’s Mediterranean-inspired bistro atop the sprawling expanse of the Newport Hotel, knows it’s about more than just the food in bringing that European seaside experience to life. It is true that walking into Bert’s, adorned in dusty pinks and shades of hunter green, does feel reminiscent of walking off the beaches of San Sebastien. Guests are greeted with a theatrical display of market fish on ice, while the kitchen team work away in a beautiful vintage kitchen complemented with copper and marble detailing. When Executive Chef, Jordan Toft, travelled through southern Europe, as to be expected, he found the entire atmosphere enchanting – the sea breeze and the ease with which he could walk straight off the beach and into a seaside restaurant to enjoy a meal of freshly caught seafood and charcoal grilled meats. Enter Kane. When Toft returned from his travels with the Bert’s concept in mind, he reached out to Kane, and it all came together in that kitchen overlooking the sea. Fresh local seafood, high-quality proteins, simple sides; cooked on the Josper and served with few additions. Rather, it’s product-driven. 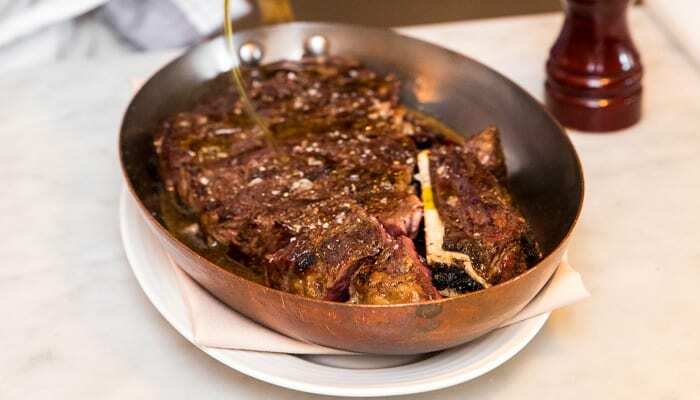 A choice of on-bone sirloin, 400g rib eye, or an 800g bone-in rib eye for two, all grass-fed from Haverick Meats’ Brooklyn Valley farm. “Simplicity is key – the iron bark embers will flavour the protein just enough to texture the meat, without overwhelming it,” he explains. Then, all it needs is a simple olive oil and confit garlic jus and a bit of lemon. When Jason Stuart was offered the head chef position at the newly renovated and relaunched Park House in the Mona Vale Hotel, it was enough to get him back from a 12-year stint in Melbourne. The truth was, he’d been looking for a reason to move back to Sydney already, so when Executive Chef, Dave Clarke reached out to him, he jumped straight in. Stuart spent the early years of his career working as Clarke’s apprentice at Quay, and now, fifteen years on, he’s back in Clarke’s kitchen, this time leading the charge. We’re discussing the Brazilian wood fire grill, which sits front and centre in the partially open kitchen. A day in Stuart’s kitchen starts with fire, sometimes as early as 7am he’s in the kitchen getting the grill going. As he’ll explain, it all depends on the moisture of the wood, so in winter it takes longer for the iron bark to burn down to the embers, which is where all the flavour comes from. Stuart cooks up proteins like steak, fish and chicken over the wood embers, basted with their own fat drippings (the start of his mission to use the whole animal). The embers are a penetrating heat, cooking through, before each cut is moved to the top grill to seal in the flavour with flame. 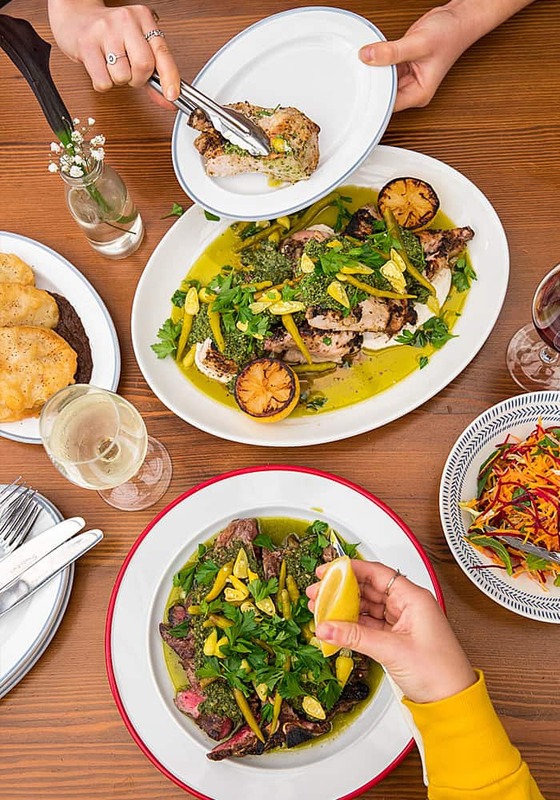 The inspiration for their menu comes from Clarke’s years travelling around the world, taking notes from the Latin American countries and even the Middle East. On the plate, the 600g Riverine T-bone is presented with a dressing of chimichurri and Turkish pickled chillies, the acidity cutting through the fattiness of the steak. “There’s an intense amount of flavour,” explains Stuart, but it’s done really simply as they would in the countries that inspired the menu, there are no heavy creams or rich flavours – just herbs, chilli, spices and maybe a bit of yogurt or labne.